This summer The Quicksilver Mine Co. will fill to the brim with small works of art in a wide range of media and style in a show featuring work by 56 northern California artists. "Working within these size constraints—12" X 12" X 12"—proved to be a bit of a challenge for some artists who are used to working large," says Quicksilver’s Khysie Horn. "But I kept thinking back 15 or 20 years ago when the California Museum of Art in Santa Rosa at the former Luther Burbank (now Wells Fargo Center for the Arts) used to do an annual small works exhibition. There was always a 12" square box at the door, and every piece of art had to fit inside that box before it could be brought in and be juried. I always loved that show, and I always wanted to do something similar here at Quicksilver." Boxed In includes mixed media paintings, prints and drawings, both representational and abstract; sculpture, collage and assemblage; ceramics; woodwork; photography, including video-based artwork. Various media used by the artists include encaustic wax, oil, watercolor and acrylic paint; canvas, paper and panel; stone, metal and clay; gourds, found objects, recycled paper and plastic; pen and ink, pastel and graphite. 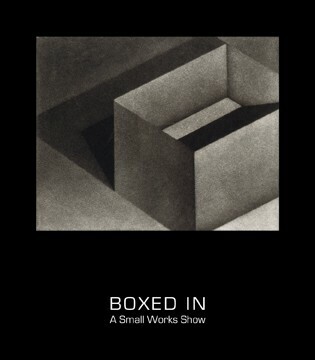 Boxed In: A Small Works Show opens with a reception for the artists on Saturday, July 9th from 4—6pm, and will continue in the gallery through August 14th.